The Master Catalog section can be reached by going to Products > Master Catalog. This is the master source of catalog and inventory for Shiprocket. All channel stock is synced with master catalog after channel SKUs are mapped with master catalog SKUs. On this screen you can view catalog items that are Active, Inactive and All Products. Further, you can manually add a product by using the “Add Product” icon on the top right of the screen. You can also use the Bulk import action to perform this activity if you have a large catalog. icon on the top left of the screen. icon . A Sample sheet will be downloaded in .CSV format. 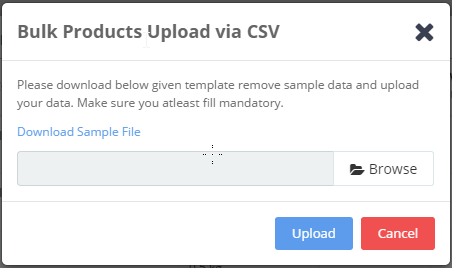 Fill in the mandatory information marked * required in the sheet to create products.